Round pan with a Lyonnaise profile to enable food to slide easily onto a plate. Perfect for frying, searing, flambéing and for displaying on the table. - 90% copper on the outside: excellent thermal conductivity; exceptional cooking results. 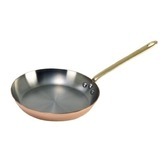 - 10% stainless steel on the inside: perfectly food grade; eliminates the need to re-tin copper for easy care. The low proportion of stainless steel does not alter the properties of copper. Prestigious range that can be brought into the dining room, ideal for serving and flambéing. For all cook tops EXCEPT induction.